Ambainis, A, Backurs, A, Smotrovs, J, & de Wolf, R. M. (2013). 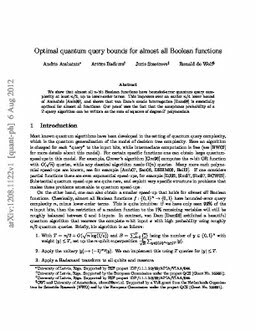 Optimal quantum query bounds for almost all Boolean functions. In Proceedings of International Symposium on Theoretical Aspects of Computer Science 2013 (STACS 30) (pp. 446–453).